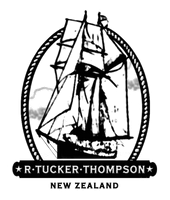 Tucker was born Robert Tucker Thompson in California in 1928 and was always called Tucker. His mother died when he was three years old and his father worked as a film processor in the movie industry. Tucker attended North Hollywood High School where he was an all-round sportsman and bought his first small yacht shortly after graduating. He went to University in Santa Barbara , but his education was interrupted by finding a yacht needing crew for a South Pacific voyage. Tucker eventually returned to Santa Barbara , where he and Anita met and married. A year later he gained a teaching degree and began teaching in Carpinteria, just south of Santa Barbara , but left teaching after one year to begin working as skipper on a large yacht moored in Santa Barbara harbour. This yacht made a voyage to the South Pacific while he was skipper. 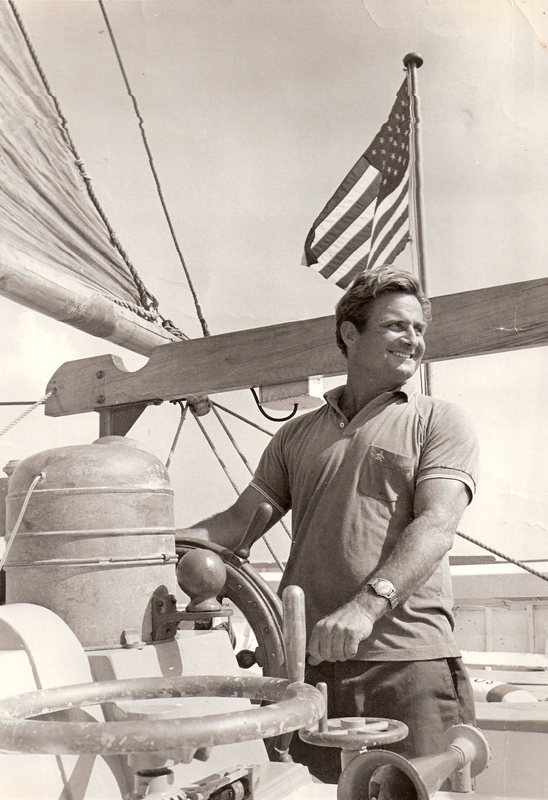 In 1964, Tucker and Anita flew to Costa Rica to deliver a yacht back to Newport Beach. Sailing up the coast of Central America , there were stories of a Baltic trading schooner that was just ahead. “Wandia” was anchored in Acapulco when we arrived there and immediately interested Tucker. The present owner was considering selling. Several months later, when the ship arrived in San Diego, the deal was done. Then the ship needed to go to work. Tucker sent letters and photos to all the film studios. A film of Michener’s book “ Hawaii ” was about to be made by Mirisch. The studio had one ship, “Thetis”, but still needed the whaling ship. After the first meeting, Tucker entered into negotiations accompanied by a marine lawyer. The result was a purchase/re-purchase agreement Re-rigging took place in San Pedro harbour in a rushed ‘ Hollywood ‘ manner—dismantling and building taking place almost simultaneously. The “Wandia” became the “Carthaginian”, complete with a warrior figurehead. Alan Villiers arrived to Captain the ship to Hawaii and be the film advisor. Also aboard was Ken Reynard (Captain -“Star of India ”) sailing as Mate, Karl Kortum (director of San Francisco Maritime Museum ), and Bill Bartz (Captain -“Balclutha”). These were the elite of California restored ships and museums. Other friends and acquaintances of Villiers filled the crew list. When filming finished and the movie company no longer needed the ship (Nov.1965), the re-purchase option was in effect. The family moved aboard and took on crew for a trip around the Islands and to California . While anchored off Lahaina, Larry Windley, director of the Lahaina Restoration Foundation, urged the members to consider purchasing the ship for a museum; by the time the ship reached Hilo , representatives had arrived there with a proposal ready for signing, to take effect when the South Pacific cruise had finished. “Carthaginian” continued on to the west coast, sailed under Golden Gate bridge and into Sausalito. Old salts that had sailed in square-rigged ships visited and swapped tales. We continued down the coast stopping at Catalina Island and Long Beach . Tucker knew there was a suitable dock at the Sea Scout Base so arranged to tie up there in exchange for taking the Sea Scouts sailing. Ralph Whitford, a teacher and scout master, was in charge of the base. Tucker’s son Tod and Ralph’s son Brian were a similar age and became good friends and made a trip to Mangawhai Heads for the launching of the “R Tucker Thompson”. Arrangements were made for the voyage of the “Carthaginian” to the Marquesas, Society Islands and Hawaii; crew arrived, the ship was provisioned and the passengers came aboard. After stopping in San Diego to haul out to clean and paint the bottom, the “Carthaginian” sailed into the Pacific heading south 4th August 1966. Mid January 1967 the ship returned to Lahaina, Maui to become a whaling ship museum. We moved ashore and Tucker was employed as Captain/Curator. By the summer of 1968 Tucker was ready to go sailing again. The family headed for Europe, moving into a VW Camper van waiting for us in Ireland. We intended to do some tourist things and eventually look for a ship in Denmark . The old sailing ships were being replaced with motor vessels and many, in all sorts of conditions, were for sale. It took some time to find a suitable ship, but when we did we moved into a flat (it was getting too cold to stay in the camper van) for the winter. The children attended the local school and a helpful librarian scoured the country for books in English for the children. All the refitting work was done in Hadsund, on the Mariager Fjord. Tucker and a young Danish builder did most of the work over the winter, which was cold. It was a novelty to walk around the ship on the ice in the winter. By spring, work was progressing well. The cargo hold had gained a large water tank and a deck house/galley had been built. All was ready for a June 1969 departure. We left the Baltic via the Kiel Canal/River Elbe to enter the North Sea and head for England. While provisioning in Devon , we were asked if the ship wanted any spirits. When Tucker heard the price of spirits, minus any tax, a variety of liquor came aboard. He did like a bargain. The “Argus” continued on to Portugal , Gibraltar , Spain and the Balearic Islands intending to stay in the Mediterranean for the winter. However, the weather turned cold, so the Caribbean beckoned. Christmas in Barbados was a contrast to the previous Christmas in Denmark. After nearly 3 months in the Caribbean, the “Argus” headed to Panama , stopping in Curacao and Aruba before entering the Panama Canal, then heading north along the coast of Central America , stopping along the way at interesting ports. We entered San Diego the end of May 1970; a number of Sea Scout representatives joined us for the sail to Newport Beach. Our friends at the Sea Scout base had been kept informed of our travels and were interested in purchasing the “Argus” to use as a training ship, but were having difficulty with financing, due to the death of a vital member of the council. This meant that our planned move to New Zealand was delayed several months. While waiting, Tucker took on a new challenge. He bought a Cessna 160 and he and Anita took flying lessons. The plane was left behind but the car we bought was shipped to New Zealand. We arrived in New Zealand in January 1971 when the country was on holiday. After a search, a caravan was found to rent and we headed north to the Bay of Islands . Friends from Hawaii were due to arrive in early February with a proposition to dry lucerne (alfalfa). This project involved bringing a disused dryer from a pineapple cannery in Hawaii (used to dry pineapple peel for animal feed) to Waverly in south Taranaki. Lucerne was used in stock food and chicken feed. (it makes egg yolks more yellow). Waverley is a farming community which welcomed the two families. There was an active tennis club in Waverley. We had all played tennis, but Tucker, who had been a North Hollywood High School tennis Ace, was pleased to be able to play again. Several years later it was time for another move. The warmth and sailing in the north appealed to Tucker. Land in Whangarei Heads was found and he set about building an unusual house. It was designed by Graeme North and set into a hillside, using poles with a ferro-cement roof. It attracted a lot of attention during the building, as it was unusual. When the house was finished, it was time for another project. The NZ government was encouraging the expansion of the fishing industry. The obvious thing to do was to build a boat that could go fishing. There was land below the house on the water’s edge which had sufficient room for a good sized boat to be built. Tucker and son Tod began working. The plating was not quite complete when Tucker became ill and needed a heart operation. He was 49 when he died. Meanwhile, the hull which need a few more plates welded on, was acquiring a patina of rust. Tod was unsure whether he wanted to take on the project, but after some serious thinking decided to finish the hull. Russell Harris and Tod had met while working on the rigging of the “Bounty” and they formed a partnership. Tod and Russell finished the ship and named her in honour of Tucker.